Udaipur: This is no place in India which appeals more to the imagination of poets and pointers, travelers and writers than Udaipur, the lovely lake side capital of Mewar, by reason of its romance and beauty and its remarkable past bristling with episodes of heroism and splendour. Udaipur, the enchanting city of Dawn, looms up like a vision in white. Surrounded by hills and mountains and set on the edge of three lakes which give on to a fertile plain, it is bewitching in all its details-narrow streets lined by vivid coloured stalls, gardens, temples and palaces - every feature, mirrored in the placid blue waters of lake Picchola. An interesting legend is related to the founding of the city. On one of the his excursions, Maharana Udai Singh of Mewar met a hermit absorbed meditation on a hill overlooking lake Picchola. The ascetic gave his blessings and also advised the Maharana to build a stronghold on the very spot as it would b well protected. The place indeed combines many natural advantages - fertile valley watered by a stream, a lake, an agreeable attitude and an amphitheatre of low mountains. The new city was planned on the bank of Picchola in 1550 A.D.
Around Udaipur are vestiges of its chivalrous past- the sprawling Chittaurgarh and the massive Kumbhalgarh the temples of Eklingji, Nathdwara and Ranakpur and finally there is Mount Abu, the only hill resort of Rajasthan, a cool, tranquil sanctuary. 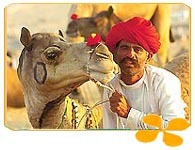 Drive along the vast stretches of Rajasthan. Be it winding mountain roads of Aravalis or secluded and Sandy desert roads or a road deep into the jungles, driving by car is the ideal way to explore the beautiful tours to Rajasthan from udaipur. Enjoy Tours to Rajasthan from Udaipur with an experienced and trusted Rajasthan travel agent & tour operator providing excellent services to its customers for many years now. Please let us know your travel requirements and we will be happy to arrange a rented car for your Fascinating Udaipur Tours and Rajasthan Tours from Udaipur. Destinations covered : Udaipur, Eklingji, Shrinath Ji (Nathdwara), Haldighati, Mount Abu, Chittorgarh, Rishabhdev, Jagat, Jaisamand, Chawand. Note: This Tour can be extended / reduced as per your requirements.